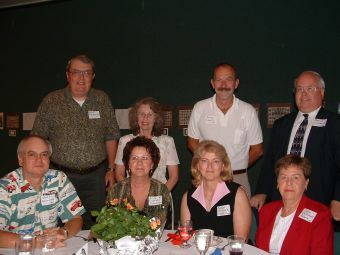 Alumni dinner-6/7/03. First row-Bud Wiseman,Judy Cooprider Timberman,Sue Shadwick Sanders,Diane Chitwood Brock. Second row-Dave Abplanalp,Joan Alfred,Jerry Cooper,Bob Grosskruetz. 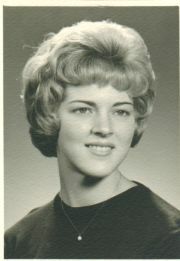 Retired from the State in 2006. But now I am working at 3 golf courses (Oak Tree, Heartland, & Winding River) in the snack bar. Loving every minute of it. Still play golf. I am still married to Tom Sanders. Together we have 5 children. 10 grandchildren, soon to be 6 great-grandchildren. And also have 2 dogs. A rottie and a scottie. Life is good. 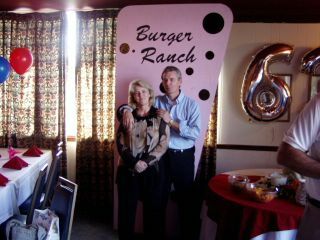 Sue with husband Tom Sanders at 40th reunion.